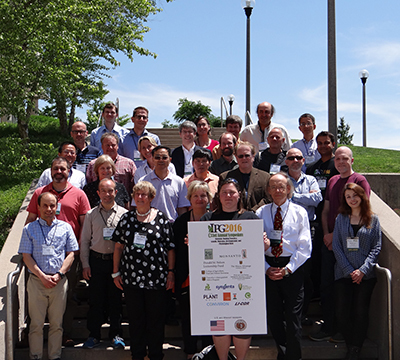 The 33rd Annual Interdisciplinary Plant Group Symposium “Heterosis: Working Towards a Genetic, Molecular, Developmental and Physiological Basis” was held May 25 – 27, 2016 in the Christopher S. Bond Life Sciences center on the University of Missouri campus in Columbia, MO. This year’s symposium brought together 171 attendees from across the globe to discuss heterosis via several approaches - genetics, epigenetics, breeding, development, physiology, proteomics, metabolomics, organelles, apomixis and systems biology. The sessions featured 23 invited speakers as well as four invited poster talks. This year’s symposium included an evening keynote featuring Dr. Jim Birchler from the Divison of Biological Sciences at MU on “A Brief History of Plant Genetics at MU: Tales of Stadler, McClintock, Sears, Redei, Coe and Neuffer”, which included discussion with emeritus MU and USDA members Dr. Gerald Neuffer, Dr. Ed Coe and Dr. Perry Gustafson. In addition to session talks, the symposium provided networking opportunities through a dinner with the speakers, exclusive for students and postdocs, and receptions and poster sessions on Wednesday and Thursday featuring nearly 40 posters. The 34th Annual Interdisciplinary Plant Group Symposium on Root Biology will be held May 31 – June 2, 2017. To be notified regarding updates on the IPG symposium, please visit www.ipg.missouri.edu/symposium. The IPG would like to thank the sponsors and exhibitors of the symposium who helped make the symposium a success.